Tabtop computing at its best? Review Billed as the year of the fondleslab, 2011 has so far failed to deliver on the hype. With sales of Motorola's Xoom sluggish at best, the BlackBerry Playbook too idiosyncratic for most and the Samsung Galaxy 10.1 tantalisingly conspicuous by its absence, Asus looks to steal a march on the competition with its Eee Pad Transformer TF101. 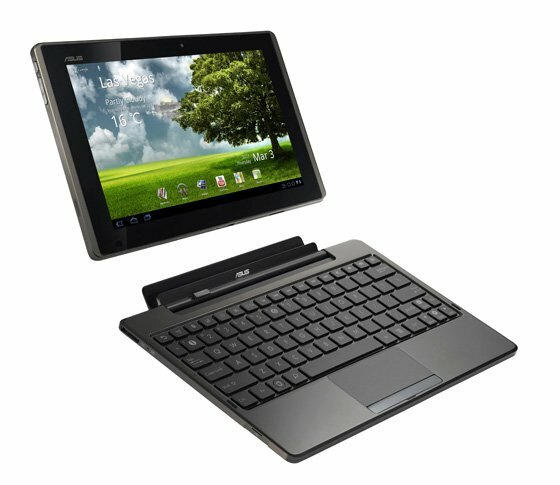 Asus might just nibble at Apple's core, too, with the 16GB and 32GB versions of its dual-core, Wi-Fi-only tablet positioned at the iPad 2-busting prices of £379 and £429 respectively. But it's the optional Eee Station keyboard which most distinguishes the Transformer from its competitors. And if you're pondering on this, Asus helps galvanise the mind with a bundle price, which works out at around £50 more, instead of paying the £119 to buy the Eee Station separately later. Those base prices might prompt Apple to look over its 'biggest-brand-in-the-world' shoulders, but it will do so with sniggering contempt. At 271mm x 175mm x 12.95mm, the Transformer is the largest tablet available. While significantly lighter than the Xoom, at 675g it's far from the one-handed holy grail that is the iPad 2, although it's comfortable in two hands over long periods of time thanks to an attractive, textured plastic backing and even weight distribution. Elsewhere, the Transformer's aesthetics are firmly utilitarian. In a distinctly vintage Casio-style, the 10.1in screen and bezel is bordered by a brown metal edge that houses a raised power button and volume rocker. Also along the line is headphone/microphone jack, mini-HDMI port and a microSD card slot – which, incidentally Motorola, actually works. There's also a reasonable on-board speaker housed in the right-hand side. Naturally, it's not great for bass, but the SRS virtual surround sound tech manages to conjure up an acceptable sound at a good volume, should you find yourself sans cans.